What do you get when you cross a traditional French brasserie with excessive American portions? You’d get La Chope Champerret, a restaurant in the 17th arrindissement. It was shocking to see these huge salads for the first time. Not that it stopped me from ordering them, mind you. There’s enough cheese on them to sink a battle ship! And my gut is a combination of a frigate and a destroyer! But this is France and food is about quality over quantity. So I’m happy to report the salads are just as tasty as they are huge. 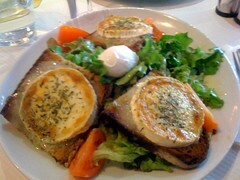 I’ve had the Sequine with a poached egg and chevre tartines, as well as the Parisienne (without the ham). The Parisienne’s cheese count was downright obscene and I loved every minute of it. I’m still on a damn diet so I haven’t tried the crème brûlée, but I’ve been told it is to die for. I’ve also seen someone with the cafe gourmande that looked decadent. La Chope Champerret is right next to the Porte de Champerret metro exit (line 3). It has patio seating and only a small step to enter. I don’t know what the bathroom situation is like, but it seems pretty wheelchair friendly.